De Facto No-fly Zone in the Works to establish Brookings-prescribed "Safe Havens." NATO has approved of stationing US-made Patriot missiles along Turkey’s border, for what it claims is “defense.” Over the past two years Syria has been fighting terrorists armed, funded, and equipped by NATO, of which Turkey is a member. Turkey has admitted its role in harboring and providing logistics for foreign fighters flooding across the border into Syria, many of whom are confirmed members of Al Qaeda. Despite this, Syria has gone through extraordinary lengths to avoid a confrontation with Turkey. Image: A Patriot missile system. NATO Source Alliance News Blog reported on November 4, 2012, “Turkey plans to officially request NATO deploy a Patriot missile defense system in its territories as a security precaution against a potential large-scale military offensive from Syria as Syrian shelling on the border raises tensions.” In reality, US officials have admitted the purpose of the missiles are to impose a no-fly zone over northern Syria. Turkey’s military has confirmed further air strikes against Kurdish rebel bases in northern Iraq. It said nine attacks were carried out by Turkish aircraft on hideouts of the Kurdistan Workers Party (PKK), mostly in the Qandil region. Last Wednesday the military said it had carried out similar strikes, a day after eight Turkish soldiers and 26 PKK rebels were killed in clashes. “Today NATO agreed to augment Turkey’s air defense by deploying Patriot missiles to Turkey. Turkey has asked for NATO’s support and we stand with Turkey in the spirit of strong solidarity,” said NATO Secretary-General Anders Fogh Rasmussen. 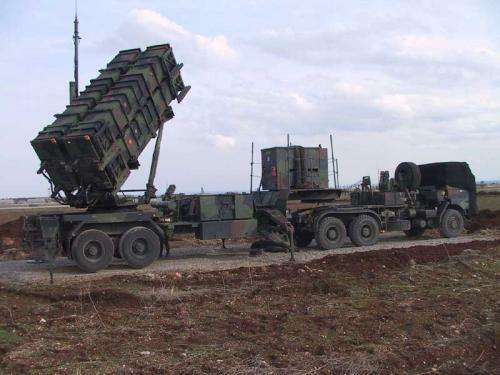 It appears then that the stationing of Patriot missiles along the Turkish-Syrian border is, in part, a means to give Turkey assurances of impunity as it continues facilitating increased, overt NATO aggression against Syria. The West’s diplomatic manipulation has failed. And because the Brookings report found considerable complications with conducting a Libya-style air campaign over Syria, (because Syrian forces are not isolated and exposed in the same manner as Libyan government forces were) it was determined that while significant damage could be accomplished versus the Syrian military from the air, it would not guarantee regime change and may lead to the necessity for the West to either “fold” or “double down with a ground invasion” (page 11). It appears then, with the deployment of Patriot missiles, the West will try to salvage the best of both options – creating a safe haven in the north of Syria by creating a no-fly zone, but without flying sorties over Syrian territory. Of course McCain fails to disclose that the extremists he “fears” pouring into Syria, are primarily from the very city of Benghazi he cited, a city he and the late US Ambassador J. Christopher Stevens personally helped establish as a region-wide terror-hub. I think Patriot missiles – now the Germans are moving some patriot missiles under some kind of weird circumstances but at least they are coming into Turkey. Or we could give them a limited number, a controlled number of MANPADS. But primarily I think it would just be a Patriot installation. Pilots are not going to fly into certain death. I don’t care how brave they are. And you shoot down one or two of them, they’re not going to fly there again. They may like Bashar al-Assad, but they like to live a little more. McCain would continue by admitting the Turkish government does not have the support of its people in supporting NATO’s attempt to implement regime change in neighboring Syria.